Let’s look more into paint protection film, what it is and how it protects your car. Will also look into how PPF affects your plan to install KI Studios stripes. 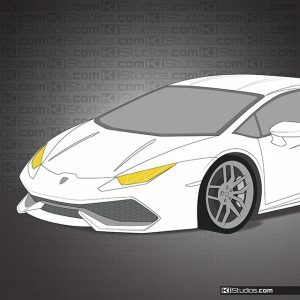 KI Studios is the premier online shop for exotic vehicle stripes. Exotic and luxury vehicles are more often than not protected with paint protection film. When planning to install stripes you need to know how these fit the big picture. Remember, PPF first, then stripes on top. As automotive enthusiasts, it is by instinct that we look out after our automotive investments. Everyday use and road hazards are for the most part what negatively affect the appearance of our vehicles. As gurus of the automotive vinyl industry, it is our devotion to make sure that we not enhance looks with racing stripes, but also protect with paint protection film. PPF from the like of XPEL, SunTek and STEK not only safeguard your vehicle’s paint, but also maintain the value of your car. They protect the vehicle from scratches, rock chips, grime and every day road hazards. All these hazards take a toll on your car over time. Self healing clear bra is a low maintenance and great looking solution for protecting your investment. Modern PPF is guaranteed to not get yellow or crack over time. The film is perfectly clear and does not show orange peel. The latest top tier PPF also comes with a hydrophobic coating to help keep it clean. While our focus is now on stripes and livery design, KI Studios has professionally installed clear bras for more than a decade. This gives us the experience we need in order to fully understand how it should be installed when also installing stripes. 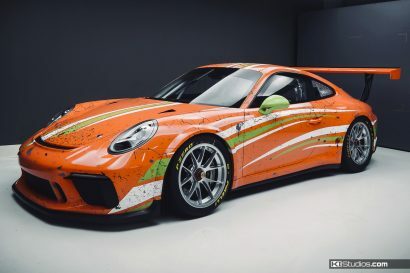 Additionally, if you are doing a full wrap livery designed by us, and you also want PPF protection, we’ll recommend you install PPF first and then the wrap. Same thing goes for stripes. Unless you want to protect original factory stripes, you most definitely want to install paint protection film first and then stripes on top of that. You can always switch out your stripes, but PPF is meant to be a long term investment. While this type of paint protection is still widely known as clear bra, the technology has evolved to the point where wrapping an entire car in clear protective film is much more common. 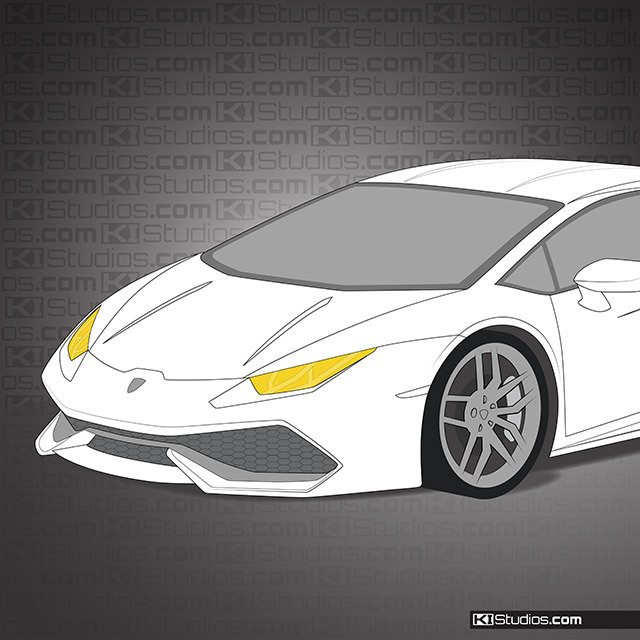 As a matter of fact, wrapping your entire car is not only feasible, but cost-effective. Should I install stripes before or after clear bra? 1. You don’t want to have to take your PPF off if you decide to remove your stripes. Stripes on top are more practical. 2. Applying PPF over your stripes will result in a silver edge / bubble where the film can’t conform to the tiny edge of the stripes. Stripes on top look best. *Note: Many paint protection films these days come with a hydrophobic top coating. This can prevent vinyl from fully sticking, especially on thin stripes or lettering. Like with a waxed car, cleaning the area where the stripe will be applied with rubbing alcohol will help prepare the surface for the stripes. The area can then be re-coated after the stripes have had plenty of time to dry. 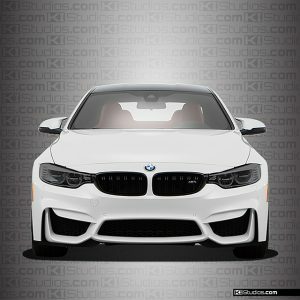 Can KI Studios headlight trim be used with paint protection film? 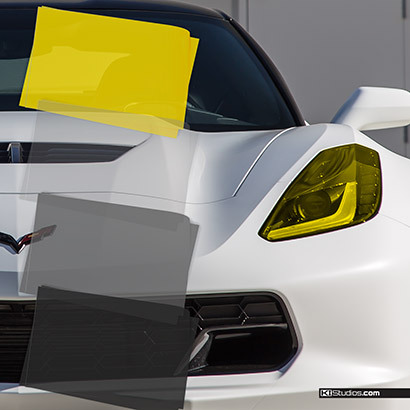 Yes – The vinyl headlight trim can be applied over the top of the paint protection film. 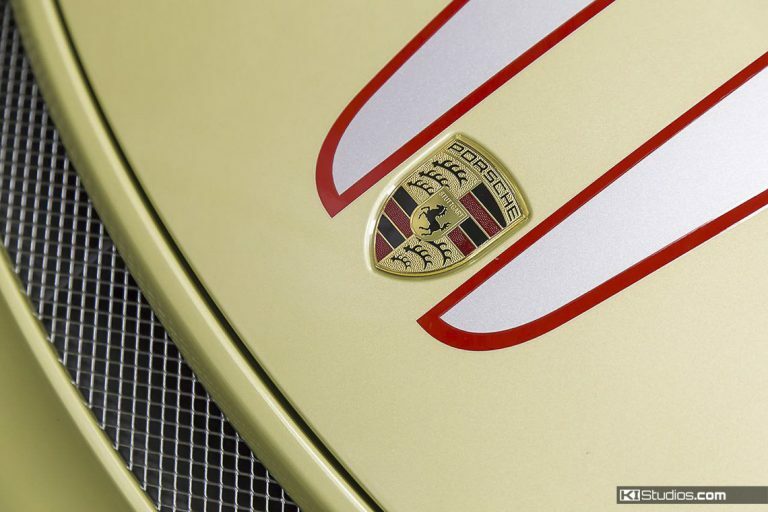 However, precut clear bra kits for Porsche headlights tend to stop short of the edge of the light. Our headlight trim kits are designed to align right on the edge of the light. The visible edge of the clear bra isn’t a good look, so we recommend having your installer bulk wrap the lights and trim to the edge, or skip the paint protection film on the headlights. What is the best brand of paint protection film? There isn’t one best film. The industry keeps growing, and new competition keeps stepping up the standards. The once industry standard 3M was overthrown by XPEL, a software company turned film manufacturer, with a smoother, self healing finish and a better warranty. 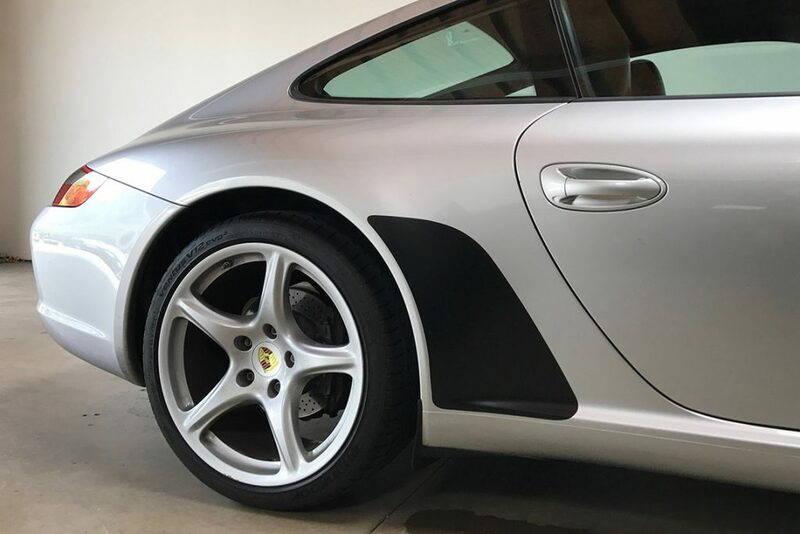 Then brands like SunTek Ultra and STEK stepped it up by including a hydrophobic top coat and advanced adhesive backing that results in cleaner installs, a glossier finish, and lower maintenance film. The latest films from STEK, SunTek, and XPEL are all self healing, carry a 10 year warranty, and are all great films. As of 2018, I am a fan of SunTek Ultra, and STEK DYNOshield. XPEL has recently replaced their ULTIMATE film with ULTIMATE PLUS, claiming better self-healing, durability and clarity. Even though a full-body clear bra is a very widely used option, there are still alternatives that can result in lower cost. Let’s look at the various alternatives out there for PPF installation and coverage. This can help you make a more informed decision for your own vehicle. Minimal paint protection package usually include the front bumper, headlights, and side mirrors. This option focuses on protecting the most usually damaged areas of your car. These are the areas that are front facing, usually lowest to the ground and take the brunt of road debris and rock chips. Because of the front-only protection, this is the style of clear film protection that pretty much defined the clear bra name. The name comes from the leather bras that some people used to put on cars back in the 80’s and 90’s. 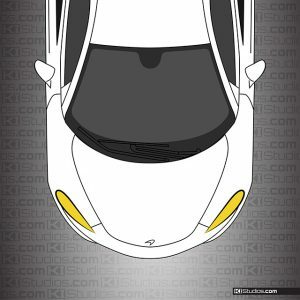 Standard clear bra packages usually include the front bumper, headlights, side mirrors, full hood, and full front fenders. When we began installing clear bra 15 years ago, film manufacturers were unable to produce a roll of material wide enough to completely cover a hood or fenders. Nowadays, manufactures make 60″ wide rolls of PPF. There is no reason to stop half way up the hood, leaving a visible line or unprotected paint. This package is the most popular clear bra package. It is also the most cost-effective package as it takes care of the areas that are most commonly damaged, including the hood. Full PPF coverage is a complete exterior wrap, covering all painted surfaces, plus the headlights. When you want the utmost in clear film paint protection, this is the package for you. A full body clear wrap ensures that every square inch of you car’s paint is protected. This package goes as far as protecting important exterior trim parts such as carbon fiber trim on high-end cars. The main benefit of doing a full clear wrap like this is you get self-healing paint protection for your entire car. This full-body protection will look great and protect the car from rock chips and swirl marks for up to 10 years. Also, because the entire body is wrapped in clear film, the surface appearance is absolutely the same throughout the whole car. Furthermore, this would be the package to choose if you want to use matte clear film to convert a car from gloss to matte. For more on that, read on…. Gloss – It’s the most popular clear bra used on exotics due to its protective qualities as well as its ability to maintain the vehicle’s high gloss appearance without added orange peel texture seen in other films. The surface of Xpel Ultimate and SunTek Ultra is so glossy and so smooth it is looks exactly like a well polished high-gloss coat of paint. Track cars, luxury vehicles and automotive collectors all seek the same properties in a protective film. Satin – XPEL Stealth and SunTek PPF M are the matte finish versions of Xpel Ultimate and SunTek Ultra. A factory painted satin black Lamborghini Aventador for example, would require a satin clear bra, to keep the same look and finish of the satin paint. Xpel Stealth and SunTek PPF M can also turn a gloss car into a satin finish without any alteration to the vehicle’s current paint. A favorite among exotics, race cars, hot rods and those looking for a bold presence. 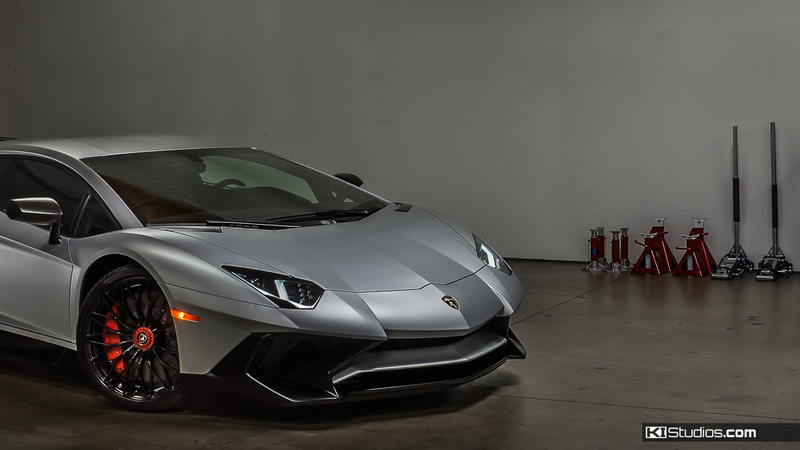 The video below shows a Lamborghini Aventador we protected with Xpel Stealth clear film. Xpel Stealth offers the same matte look as the high-end matte paints. This way you can keep the matte look, yet still get the protection your car deserves. Paint protection film is not only used for covering large sections of a vehicle’s finish. PPF is also perfect for spot treating important areas. A great example of this is the protection of headlights. Another example is stone guards for the front of the rear fenders on Porsche 911 cars. 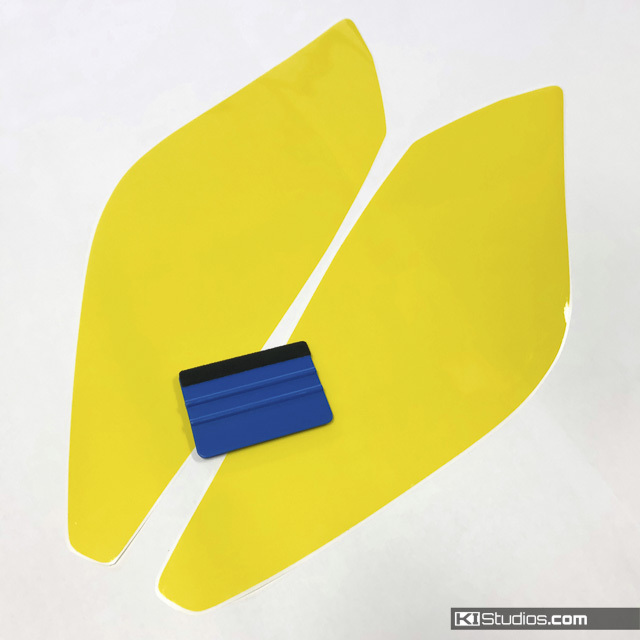 We sell these stone guards in both clear self-healing PPF and thick black matte vinyl. 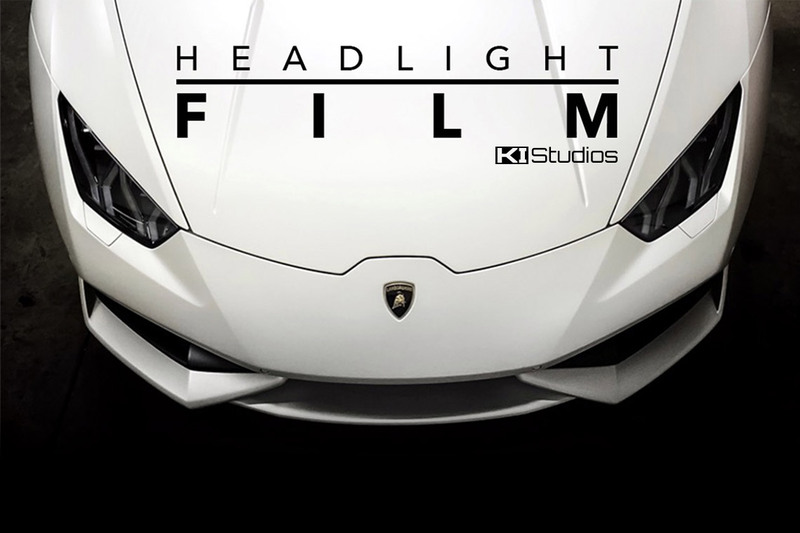 See below for examples of KI Studios Headlight Film. This product is PPF, yet we offer it in two different shades of smoke, yellow and of course, clear. Below is a photo of our stone guards. The photo links to the Porsche 991 stone guards. We also have them for 997 and 987. Now that you know that it’s best to install PPF first you can better plan for your stripes or wrap kit. 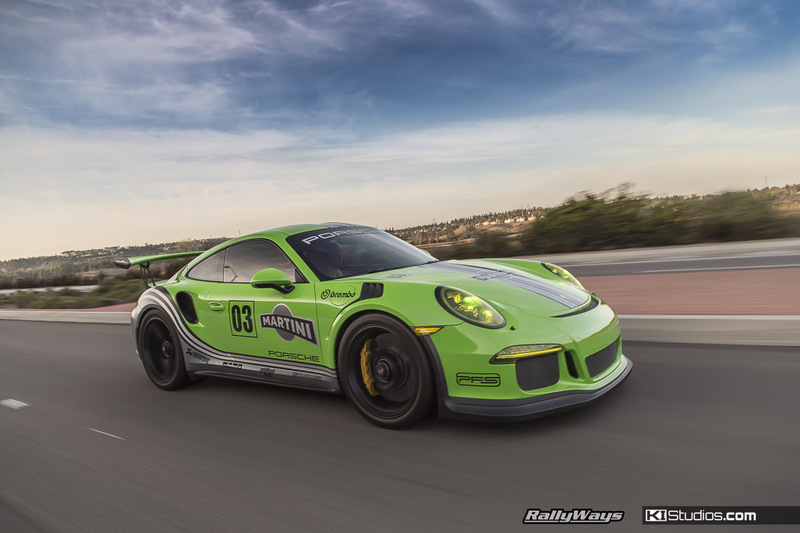 See the photo of the green Porsche 991 GT3 RS below. This car is a perfect example of installing PPF prior to installing a wrap. This car features custom martini stripes designed by us. In the entire green color of the car is a wrap using Avery-Dennison Supreme Wrapping Film. On top of that we layered the stripes. However under it all it a full body clear bra PPF. This car saw a few different designs after this one. Every time, the wrap was peeled off, but the original full body paint protection was left intact ready to accept another wrap. 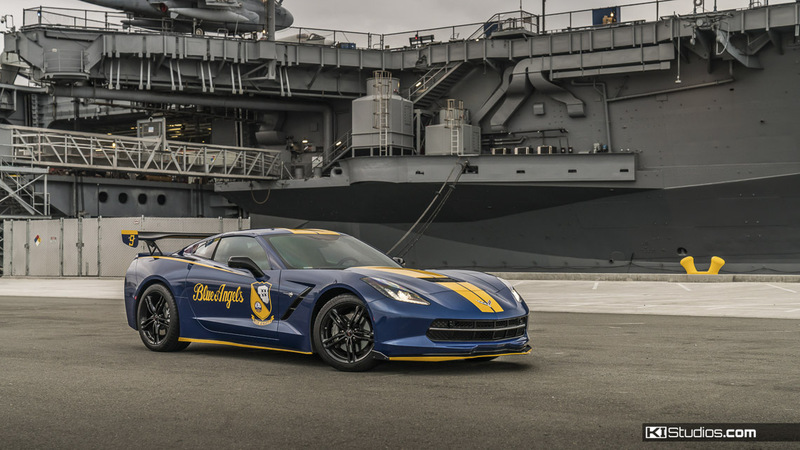 Then, check out this Corvette C7 decorated with Blue Angels graphics. This car is black from factory. Full body PPF was installed. Our custom Blue Angels livery was then installed over the PPF. This car has also seen many designs past this one. Every single time, the original PPF installed was left intact between wrappings. Whether or not you decided to install PPF, you can always install stripes or a wrap. 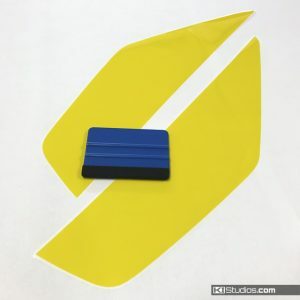 Shop our online store for stripes and wraps for Porsche, Ferrari, Lamborghini, McLaren and more.